...they never look like a proper "stack". They start out looking tall and layered, then slump down into flat little slabs while they cook. They taste good, but I clearly have not figured out how to make them resemble a tower of tortillas. I tried this before, when I made Enchilada Stacks With Chicken And White Beans. They were delicious, but were seriously lacking in height. So, when Scott at Sugar and Lard issued a Tower Of Tortillas Challenge, I figured I would give it another go. Well, it was the same result as before--a flat, but tasty disk. As Scott is giving style points for height and number of tortillas used, I'm clearly doomed. But, I think I may have spotted where I went wrong. If you're a master of making a stack, let me know your secrets. I spent today battling the rose bushes in my yard. January is almost over and I needed to prune the most vicious specimens in my yard. They all have long thorns shaped like giant fishooks that grab at your clothes, hair and skin. At one point two very large branches that I cut off became entangled on my shirt and pants. I couldn't get them off and the more I tried to remove them, the more firmly attached they became. One was stuck to the crotch of my jeans and hanging between my legs, threatening to trip me. The other was stuck to the front of my shirt. You're thinking, "Oh come on, it's rose clippings, how bad can that be?" These were thick branches, three feet long, with long thorns sunk into my clothes and skin. As I stumbled around trying to get them off, swearing constantly, I saw that Upsie was calmly watching with something that looked like a smile on her face. It's not every day that you have a large rose branch stuck to your crotch. I refused to call Bob for help, because I felt the whole thing would be too amusing for him. So, when I finally finished in the yard, bleeding from the war of the roses, I was in no mood to cook. But, I decided to do the Tower Of Tortillas Challenge. One good thing was that this was easy and fast. I quickly made refried black beans, using canned beans. I defrosted some salsa, grated some cheese and sliced green onions and began to build towers. Right off the bat, I erred by putting too thick a layer of black beans. This made the stacks hard to remove from the baking pan. Then I added two more layers of cheese and green onions. Even though they weren't very tall, they certainly tasted good. And they were quite filling. Just a wedge is the same of one enchilada, I would think. I must add, they taste very good. Make sure you go over to Scott's to see what kind of tortilla towers other people build. Preheat oven to 350 degrees F. Spread a litt;e salsa in the bottom of a baking dish. Put about 1 cup of the salsa in a small skillet and heat until hot. Heat several tablespoons oil in a skillet. When it's hot, dip a tortilla in the oil for about 20 seconds and then dip it in the salsa. Or you can skip the oil part and just dip it in the salsa in the skillet. 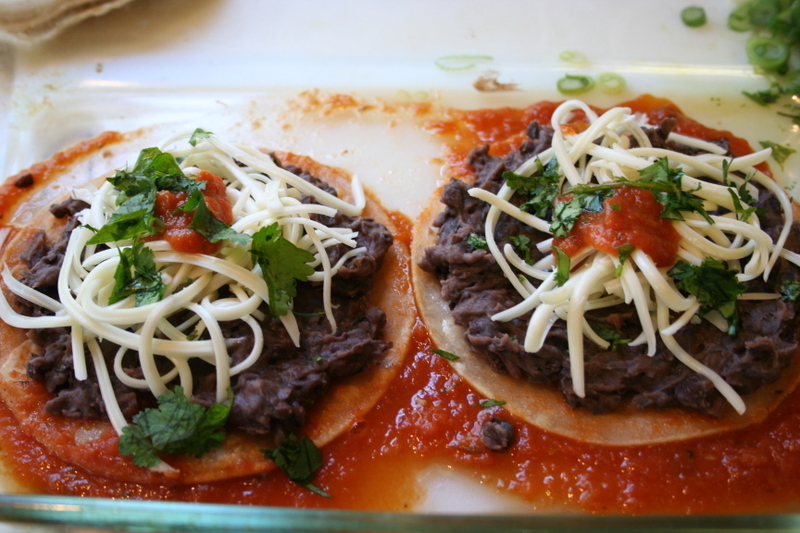 Place the tortilla in the baking dish and top with a layer of black beans, cheese and salsa. Add another tortilla that has been dipped in oil and salsa on top of the black beans and top it with cheese, green onions and salsa. Then add another tortilla on top of that. You can then keep adding layers. I added another layer of cheese and green onions. When you're done layering, add some cheese and salsa on top of the stacks and bake in the oven for 20 minutes. Sher. 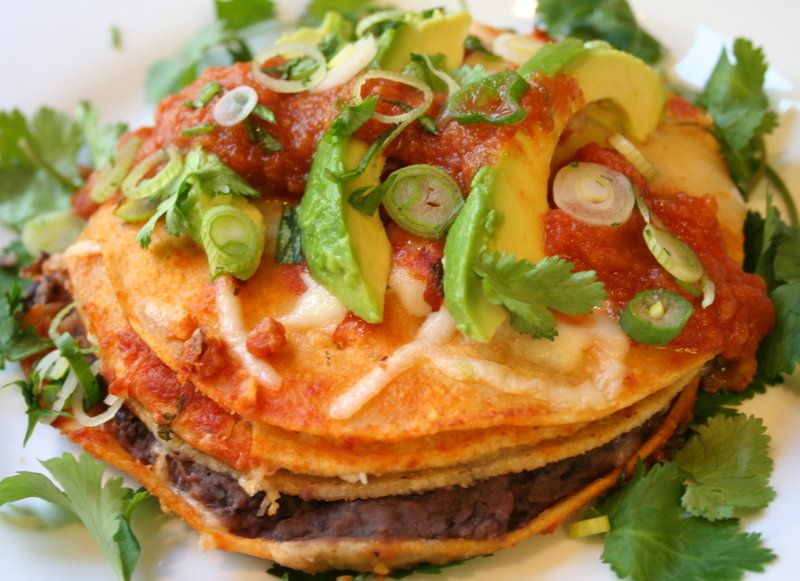 Your Enchilada Stacks are so yummy! Forget the height or stacking prob, as long as they taste good! And I am sure yours are tasty! Well, I see right away what the problem here is with your stacks girl. There isn't one on my plate! The look beautiful. I know they must have tasted great! Just remember, size DOESN'T count! They look wonderful. I was going to say that the problem with your enchilada stack is that it's not at my house where I can eat it, but I see from the other comments that that's not an original thought so I'm not going to say it. Instead I'll simply say, that looks like a delicious meal and just the thing to restore your strength after doing hand-to-hand combat (thorn to crotch combat?) with a rose bush. They look extremely tasty! And colourful! You'll definitely win points for that. Height or not, I bet they made up for the War of the Roses. They look delicious! 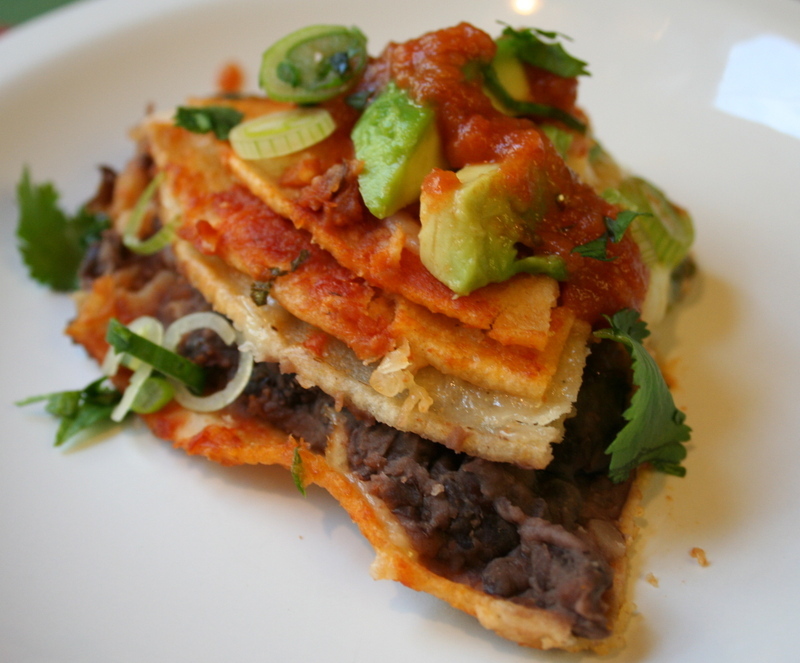 It is 8:30am and you have made me crave enchilada stacks. AT 8:30 IN THE MORNING! I am now impatiently counting down the hours until I can get home and make these myself. Ten, ten hours. . . sigh. Don't you have to prune the bushes by end of fall ? We do it by end of Nov, else it gets real cold. Thank you, they were tasty. I just wondered why I see pictures of other people doing a stack and theirs look much prettier. But, ultimately taste is what counts? :) Well, that's my story and I'm sticking to it! Than you! If I could, I would magically "think" one onto your plate! Thank you! Oh yes, Upsie seemed to get a lot of pleasure watching me stumble around trying to get those branches off myself!!!! Thank you! Yes, they were very comforting--and that's always a good thing. Thank you! I hope you enjoy them as much as we did. I think some people just layer them in a casserole like lasagna. That probably works out pretty good. Thank you! Out here in California, they always tell you to do it in January. It's the same situation for pruning other things. So, time is running out for me. I still have some crazy climbing roses to prune this week. Ugh! They look mean. I don't think these colors could get any brighter. What a perfectly beautiful recipe. Thanks for sharing AND i love the step by step photos -- I know it will come in handy for me. I'm making this tomorrow! The only problem I see with your stack is that it isn't on a plate in front of me for dinner. Looks amazing!! It looks great to me! Oh yum!!! Here's another recipe I'm bookmarking! :) Thank you! I need to get over being sick so I can utilize the big bag of blue corn tortillas in the fridge, the salsa verde and the pork carnitas into something like your enchilada stack. The problem with your enchilada stack is that I'm going to come over and eat them all!!! What a bad idea to come to your blog at this hour of night, when i'm hungry! Those pictures are delicious and so alive. Problem? I don't see a problem! (We had tacos tonight so I'm a little over corn tortillas right now....) My only suggestion for keeping them taller is fill them more -- but I still think they'd fall with the heat. Yum any way you look at it though! Your tortilla stacks look wonderful! Doesn't matter that they're short stacks (which is a nickname my sister gave me, by the way - shortstack). I love the way you described your rose bramble dilemma. Berry canes are notorious for that. I've learned to hold very still and ease them out the way they went in. Thanks for thinking of me Sher! I make enchiladas just so I can eat avocados:). They look heavenly!